John took the video above last week. The weight is light and my form could be better, but it feels good to be able to get the weight up at all (partial credit, of course, goes to my 25-lb rugrat who insists on being “up-ah!”). I know I’ve lost a lot of strength in the last several months, mostly just due to lack of time (since clinics started in January, I’ve only made it to the box 1-2 days/week, weekends only). 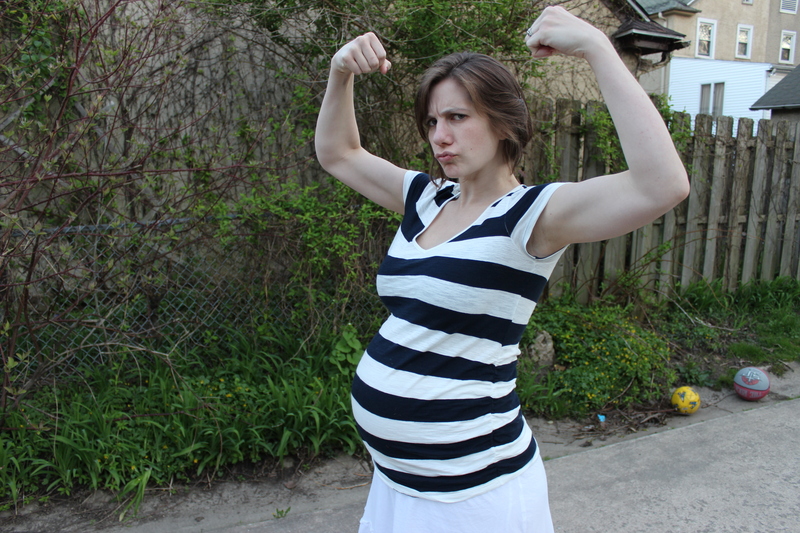 I hear about pregnant women with hormone surges PR-ing deadlifts and bench presses. Not me. But at 38 weeks pregnant, I’m pretty thrilled with my merely trace pedal edema and negligible back strain. Sunday’s WOD was particularly heart-warming (can I describe a workout as “heart-warming” or just “heart-burning”?). A mixture of running/rowing and back squats, it took me over twice the time as it took most of my fellow crossfitters to finish. Everyone stayed. Everyone counted down my last set of back squats. Everyone cheered when I finished. And then, by the time I returned from the water fountain, somehow all my equipment was mysteriously cleaned and put away. I freaking love this community! It must also be said that nearly all of my local mom friends I made through crossfit. When Ari was three months old, it was dreary January, most of my friends were studying for boards in the city, and I felt a bit isolated by myself with an infant in the suburbs. Since I could only go out for a real run when John’s schedule permitted and I wasn’t peal-myself-off-the-couch exhausted, I was also feeling soft and doughy around the edges. Enter our local box. John comes home one day and says, “So there’s the gym that recently opened. It’s different. There are special work-outs for each day, and you all do them together. There’s weight-lifting involved, and you’re kind of in competition with yourself. Basically, I think you’d hate it. But there’s free babysitting.” Sold. But by far the greatest component has been the friendships cultivated <insert sappy “Wonder Years” or other similar theme music here>. Since babysitting is offered at 2 WODs daily, there are regular strong mamas who show up for those particular WODs. Nothing initiates a friendship like the great demonstrator of trust and respect that is spotting. These women (mothers or not) have become those I turn for help and guidance, regarding my body, my profession, my family, child-rearing, health, you name it. They have also come through for me/us in ways I would have never expected from relatively young friendships: from watching Ari at a moment’s notice when childcare fell through, to picking us up from the airport at the end of a long weekend and even bringing us dinner since they (rightfully) assumed we would have nothing in the house, to answering my every paranoid question about pregnancy and it’s many dramas this go-round. I am indebted to these women (and to crossfit by proxy); they have brought so much happiness and support into our lives.